Process an XYZ file of atomic coordinates and filter atoms via threshold or map variable values. Mesoscale microstructure simulations using the phase field method can be utilized to generate initial structures for large sacle molecular dynamics simulations. 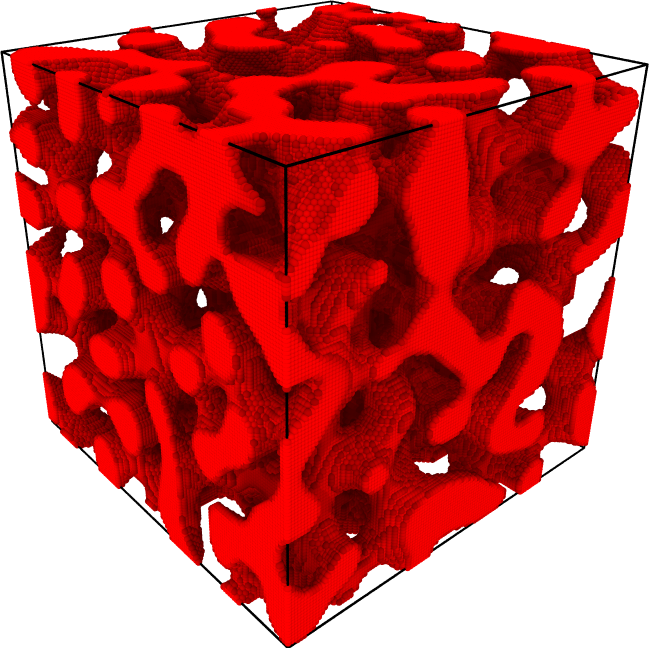 One application is the construction of nano-foam atomistic samples from simulations of spinodal decomposition. Nano foam atomistic configuration generated using the SolutionRasterizer. MOOSE will load the .xyz input and finite element mesh superpose both and use thresholding to carve out _rejected_ atoms while retaining _accepted_ atoms. Finally a new .xyz output is written containing only the _accepted_ atoms, generating a porous microstructure. xyz_input An .xyz file as an input file. This input file should contain an atomistic simulation cell completely filled with atoms of a chosen crystal structure (a polycrystalline sample can be supplied). xyz_output Output file** containing the filtered (or mapped) atomic coordinate file. raster_mode = FILTER In FILTER mode the SolutionRasterizer uses thresholding on a specified non-linear variable to reject or accept atom from the input file to pass to the output .xyz file. raster_mode = MAP In MAP mode the SolutionRasterizer takes the atoms from the input file and add an additional column to the data set containing the value of a specified non-linear variable. threshold Value of the selected non-linear variable to use in FILTER mode used to _accept_ or _reject_ atoms from the xyz_input file. variableVariable from the mesh file to use for mapping to or filtering of the atoms. Description:Variable from the mesh file to use for mapping to or filtering of the atoms. meshThe name of the mesh file (must be xda or exodusII file). Description:The name of the mesh file (must be xda or exodusII file). rotation1_vector0 0 1Vector about which to rotate points of the simulation. Description:Vector about which to rotate points of the simulation. rotation1_angle0Anticlockwise rotation angle (in degrees) to use for rotation about rotation1_vector. Description:Anticlockwise rotation angle (in degrees) to use for rotation about rotation1_vector. timestepIndex of the single timestep used or "LATEST" for the last timestep (exodusII only). If not supplied, time interpolation will occur. Description:Index of the single timestep used or "LATEST" for the last timestep (exodusII only). If not supplied, time interpolation will occur. transformation_ordertranslation scaleThe order to perform the operations in. Define R0 to be the rotation matrix encoded by rotation0_vector and rotation0_angle. Similarly for R1. Denote the scale by s, the scale_multiplier by m, and the translation by t. Then, given a point x in the simulation, if transformation_order = 'rotation0 scale_multiplier translation scale rotation1' then form p = R1*(R0*x*m - t)/s. Then the values provided by the SolutionUserObject at point x in the simulation are the variable values at point p in the mesh. Description:The order to perform the operations in. Define R0 to be the rotation matrix encoded by rotation0_vector and rotation0_angle. Similarly for R1. Denote the scale by s, the scale_multiplier by m, and the translation by t. Then, given a point x in the simulation, if transformation_order = 'rotation0 scale_multiplier translation scale rotation1' then form p = R1*(R0*x*m - t)/s. Then the values provided by the SolutionUserObject at point x in the simulation are the variable values at point p in the mesh. systemnl0The name of the system to pull values out of (xda only). Description:The name of the system to pull values out of (xda only). rotation0_angle0Anticlockwise rotation angle (in degrees) to use for rotation about rotation0_vector. Description:Anticlockwise rotation angle (in degrees) to use for rotation about rotation0_vector. thresholdAccept atoms with a variable value above this threshold in FILTER mode. Description:Accept atoms with a variable value above this threshold in FILTER mode. rotation0_vector0 0 1Vector about which to rotate points of the simulation. esThe name of the file holding the equation system info in xda format (xda only). Description:The name of the file holding the equation system info in xda format (xda only).